Heat ghee or margarine in a heavy bottomed skillet over medium heat. Add jaggery or palm sugar, coconut and sesame seeds, stirring constantly until the jaggery or sugar melts and becomes sticky. Set aside and allow filling mixture to cook for 30 minutes. Make a soft dough by adding oil and salt to the flour until you have a soft, workable ball. Divide the dough into pieces, forming balls 2-3 inches in diameter. Make a well in each ball of dough and fill with 1 Tbsp of stuffing, pinching the opening shut to form a cone shaped packet. Be sure none of the filling is exposed or it will melt and make a mess while frying or steaming! Heat oil in a deep fryer or deep heavy-bottomed (cast iron) skillet. Fry the dumplings until golden brown 3-5 minutes. Enjoy! Take oil in a kadai and deep fry the Modaks till light brown. 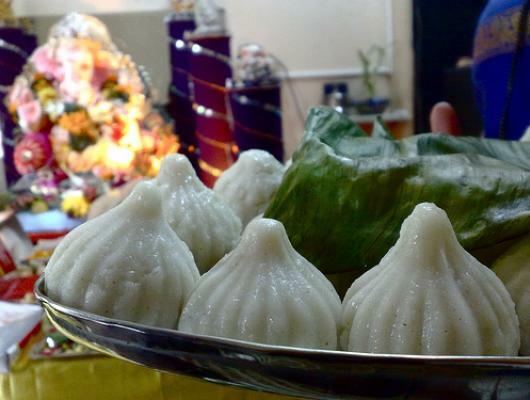 A traditional recipe for the Hindu festival of Ganesh/Vinayaka Chaturthi - gluten free and easily dairy free!